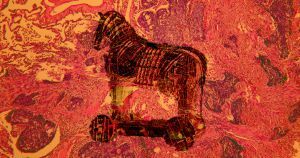 According to “The Iliad,” the Greeks won the Trojan War by sneaking a few dozen soldiers into the city of Troy inside a giant wooden horse disguised as a gift of surrender. The men waited until nightfall before emerging from the horse and opening the city gates for the rest of the Greek army, which destroyed Troy and ended the war. It wasn’t the most forthright battle plan, but it worked. And now, U.K. researchers are using a similar tactic in the fight against hard-to-treat cancers — with extremely promising results. Researchers from the Institute of Cancer Research, London (ICR), and The Royal Marsden NHS Foundation Trust have created a new cancer drug called tisotumab vedotin (TV) that combines a chemotherapy agent with an antibody. This antibody attaches to markers on a cancer cell’s surface in a way that causes the cell to draw in the chemotherapy drug — which then attack the cell from the inside, like the Greek soldiers attacking Troy. On Thursday, the researchers published the details of a clinical trial of TV in the journal The Lancet Oncology. This trial involved 147 patients with a variety of cancers, including ovarian, cervical, and esophageal. For the majority of trial participants, the cancer was already in an advanced stage and had proven resistant to several other types of treatment. According to the press release, a “significant minority” of trial participants saw their tumors either shrink or stop growing following treatment with the new cancer drug. On average, the positive response lasted 5.7 months, but some patients went 9.5 months before the effect of the TV wore off. The research team is already testing TV in trials featuring several other types of cancer, including bowel, pancreatic, and head and neck. It’s also moving forward with a phase II trial of the cancer drug as a secondary treatment for cervical cancer.